Like many strong relationships, Yoga and I did not hit it off right away. I was in college enjoying strenuous exercise. I’d run, take step, and get in some abs all in one day. I was cardio crazy. There was nothing better than heading out on the trails for a challenging run after sitting in class for several hours. I loved to work out. I loved to run. I still do. But, for some reason or another, my mind was calling for something else. I was studying - A LOT. Something I never had to do before. It was stressful. I was really busy and always on the go. My brain was begging for a break. My migraines were progressively getting more frequent and more debilitating. So, I walked into a yoga studio one afternoon. “I’ll try yoga.” I thought. Can’t be that hard. I can workout for hours. I love fitness. I hated yoga. It. was. so. slooooowwww. And it was hard to go that slow. I wanted to like it. I really did. I tried again. And again. And again. Somewhere along the 4th or 5th time I walked into that yoga studio, I finally found a class that moved. I got sweaty as we flowed and then magic happened when we ended this hard workout with a long Savasana complete with lavender oil. It was beautiful. Perfect. So relaxing. I walked out of the studio that knowing that I found IT. On my yoga mat, I have to stop. To listen. To respect and love my body. To relax. Fast forward, many practices and hours of teacher training and I still find my mat one of the most relaxing places on earth – even when it’s hard. It’s only October, but if you’re anything like me, you’re already making plans for the holidays. In a couple weeks, we’ll be packing up our two little guys and dog for a couple of long car rides. There will be lots of food, little time to exercise, and a lot to orchestrate. To put it simply, it will be busy. If you’re finding yourself needing to de-stress, there’s nothing that will boost a tired mind and body like a restorative yoga practice. So grab a couple blankets, tune into Pandora’s Yoga Radio, and RESTORE you mind and body with Yoga! Restorative yoga uses the support of props and gravity to passively stretch the body, calm the mind, relieve tension and stress, relieve muscle aches, and improve sleep. Even practicing one pose can help calm your mind and body. I also enjoy adding some gentle movement between each posture. To begin your practice, gather your props and find a quiet space. Gentle music is not required buy can help set the mood. If you are concerned you will fall asleep, set an alarm for the time you must awaken so you don’t have to worry about missing your next appointment. Set up your props and move into the pose. Begin with 5-10 deep breaths, noticing your breath as you inhale and exhale. As you feel ready, surrender to your natural breath and the support of your props. If you find your mind continues to wander, come back to your breath stating to yourself “inhale” as you inhale and “exhale” as you exhale. When you are ready to move out of the pose, do so slowly and allow your body time to awaken. Forward folds help bring your attention inward and cultivate a sense of calm. This version is a gentle hamstring, calf, and low back stretch. In a supported version of this relaxing pose, allow yourself to melt into your props. Salamba Balasana stretches the back of your body and neck. Be sure to repeat this pose with your head facing both directions. If this is uncomfortable to your neck, cross your arms and rest your forehead on your forearms or hands. To relieve achy knees, place a blanket in behind your knees in between your upper and lower legs. This one makes me smile. Yes, it's just laying on your belly with your arms folded and forehead resting on your arms, but this gentle back bend helps release your low back and stretches your chest, neck, and possibly your hip flexors, making it a great pose to reverse the effects of sitting at your desk or in the car or plane for hours. Be sure to open your legs wide enough that you don't feel like you have to hold your legs up with your toes. Breathe deeply in the beginning of this pose to find some length in your body and help you release your muscles. After shopping, cooking, and wrapping presents or really, after any busy day, Varparita Karani is a great way to unwind. This inversion can help bring calm and perspective into your day as it stretches your hamstrings and low back and provides relief to tired, sore legs and feet. The blanket (or sandbag, pillow, or block) on top of your feet is not necessary, but a little weight on your feet can add some nice grounding and gentle support to an achy back. This pose is recommended by many yogis as the go-to for ailments: headache, back ache, leg/foot aches, digestive issues, insomnia, menstrual pain, menopause, high and low blood pressure...and the list goes on. A variation of the traditional final relaxation pose of any yoga practice, this pose is all about relaxing and letting go. Your arms and hands should be where ever is most comfortable for you. If you need more grounding, lay a blanket, pillow, bolster, or sand bag on your belly. Breathe. Inhale. Exhale. Inhale. Exhale. Let go of all thoughts and allow yourself to just "be." This or a combo of Supported Fish and Savasana are my go to when I need to press "reset" on my body or my mind (or both!) 5-10-30 minutes and I'm ready to tackle chasing my sons after a full day of work, long workout on the weekend, or cooking Thanksgiving Dinner. May you have a wonderful holiday season this year full of love and the smiles from the people that make your heart shine! Amanda received her Bachelor of Arts in Exercise and Sport Science from the University of North Carolina at Chapel Hill. Passionate about health and fitness, Amanda worked in the fitness and wellness industry for 6 years prior to joining the Recreation and Fitness Center team in 2011. At the RFC, she enjoys sharing her passion with the SAS Community through personal training, group exercise instruction, teaching yoga, and coaching recreational endurance athletes. A wife, working mother, triathlete, and yogini herself, wellness is an important theme in both her personal and professional life. Amanda is registered through Yoga Alliance as a 200 hour Yoga Teacher (RYT200), certified in personal training and group exercise instruction through the Aerobics and Fitness Association of America (AFAA), and is an IRONMAN Certified Coach. Thanks Amanda for a great article and I love the photos. Yoga is a really great way to relax and calm ourselves after a very hectic and stressful week. It also serves as a reminder that we should take things slow from time to time so we can fully revel in the now. 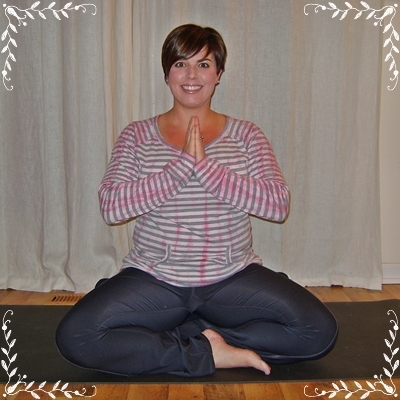 Glad you found your path with yoga!